A Beautiful & Peaceful Holiday Home. For The Perfect Getaway. Property 31: A Beautiful & Peaceful Holiday Home. For The Perfect Getaway. 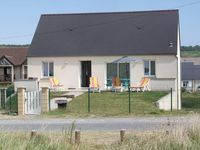 Property 35: Cottage "The Mezzanine"
Good location by the beach. We could surf or swim then dash back for a hot shower in our costume or wet-suit. The house is very well-insulted so warmed up quickly and stayed cosy (it was the end of October). Open plan lay-out so good for chatting while cooking or clearing away.